Thinking about a unique way to outfit your Caravan shelter for your next outdoor event? Think about adding this Caravan 20 Foot Professional Side Rail with Hardware. 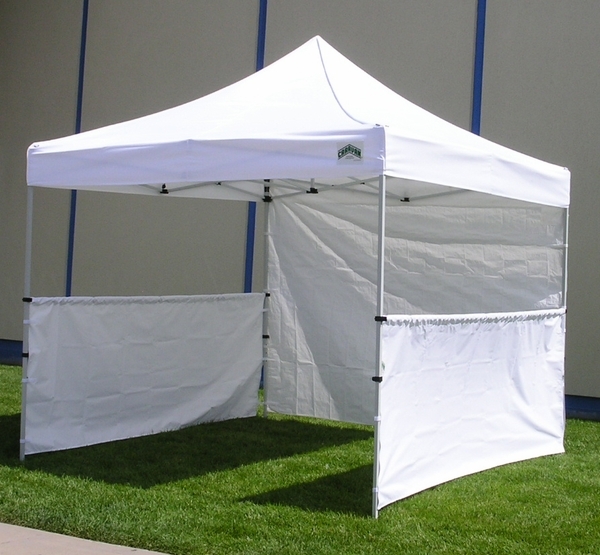 Not only will your shelter stand out from the crowd, but you'll also get the added benefits of a finished appearance, limiting foot traffic in areas where you don't want it, and just creating a more enclosed structure when you need a slightly more formal setting outdoors. This 20 ft. side rail attaches easily to a 20-foot long wall of any suitably sized Caravan shelter. The rail is constructed of professional grade 500 denier polyester, so you don't have any difference in the quality of your tent top and the side rail. And like the top, this rail is fire and water resistant, so safety is not an issue. Once in place, the 43 inch high rail provides a number of benefits. The deterrent provided towards people walking through your tent space has already been discussed, but there are also benefits like creating a space that is attractive for specialized outdoor uses. Occasions like marketing expos, trade shows, craft fairs, and similar events often necessitate specialized equipment, and in many of those situations this side rail is the perfect solution. You don't have to be selling anything or trying to get a message out to enjoy this side rail, though. All you have to do is want a distinctive, functional addition to your shelter that provides a more defined look and feel to your tent area. Getting your outdoor shelter working just right doesn't have to take a ton of effort, for many owners it's as simple as adding this Caravan 20 Foot Professional Side Rail with Hardware to their setup. PLEASE NOTE* Purchase includes one siderail and hardware ONLY. To get 'wrap-around' coverage, multiple siderails will be required. WARNING: This product can expose you to chemicals including Diethylhexyl Phthalate, which is known to the State of California to cause cancer, birth defects, or other reproductive harm. For more information go to www.P65Warnings.ca.gov.